A light-hearted look at one family's attempts to improve the quality of their food in suburban America. Quick update on the spring garden. 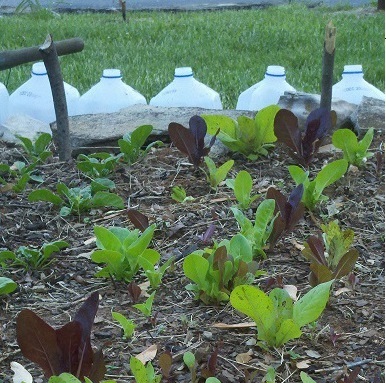 The lettuce and spinach are coming up nicely. We're already seeing weather in the 70s in April here in zone 7b. Hopefully the spinach will grow a bit more before bolting. The lettuce is just a mix of red, green, and speckled romaine. They do very well for me in hot (70-80F) in raised beds, though their flavor does bitter toward the upper temperatures. You can also see my improvised mini-greenhouses in the background (reclaimed milk jugs). These have done surprisingly well. You just cut around 90% of the jug, leaving an inch or so under the handle for a flap. Fill to 1/4" inch under the bottom portion with potting soil, add 2 or 3 pepper, tomato, or other seed, and then duct tape the jug back together. I set these out a little late (February), so the seedlings just barely have 2 leaves on them. You can sent them out in December if you wanted, the seedlings will stay safe and sound from frost, snow, you name it. Just add a bit of water every 2 or 3 days. The asparagus is establishing well (on the right). Pretty spindly, but that is first year growth for you. I used the trench plant method. Dig a tench about 12" deep and 12" wide or more. Amend with plenty of organic matter, and spread your asparagus crown roots in all directions. Then cover with just enough dirt that the crown is still visible but the roots are well covered. After the first year growth dies back this fall, I'll go ahead and fill in the rest of the tench. This should provide a strong root system for a small second year harvest, and then plenty after that. 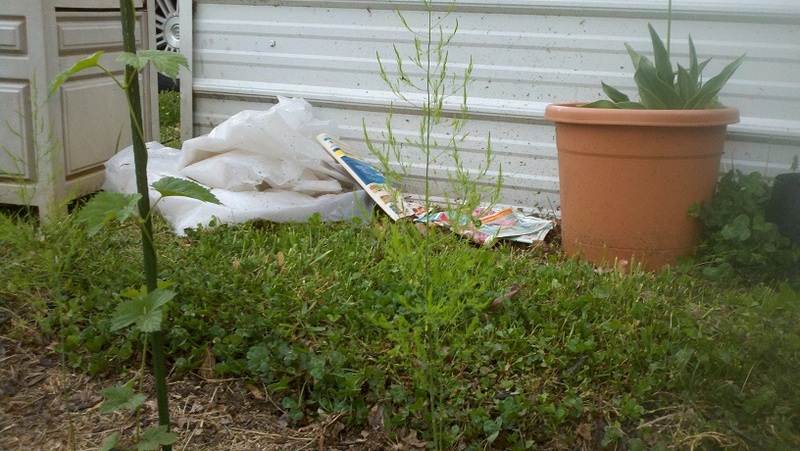 I decided to go with the Mary Washington asparagus for a mix of male and female plants. My hope is plenty of baby asparagus plants self-seeding over the years for a permanent asparagus patch. Growing all male plants (like Jersey Knight's are typically sold) allow for a greater yield, but the patch will have a limited lifespan. And the Cascade Hops to the left are going very well this year. They'll grow up to 1' foot per day in the late spring. And then we have the strawberry plant, doing just wonderfully. I opted for a mix of June-bearing and everbearing plants, 100 in all. They're spaced very close together (less than 12"), so I'll have to be diligent about cutting back any runners or it'll turn into a poor producing ground cover. 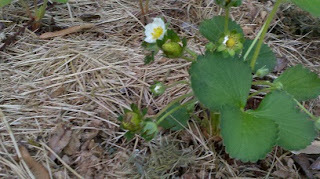 The strawberries are grown on a spur of the moment raised bed. My original plan for a circular planter was nixed because I noticed the northern part wouldn't receive enough sun. So I laid out a row of newspaper, 4 sheets thick and about 3' deep, and covered with about 6" of well amended soil. For "straw" i just use lawn clippings (just make sure you haven't been using any pesticides on it or have grass going to seed).